Change things up with these side-trips from Hervey Bay: Bundaberg (Bundaberg Rum Distillery, Alexandra Park, & more). The adventure continues: grab your bike and head to Esplanade, make a splash at WetSide Water Park, admire the natural beauty at Hervey Bay Botanic Gardens, and take in the waterfront at The Pier. 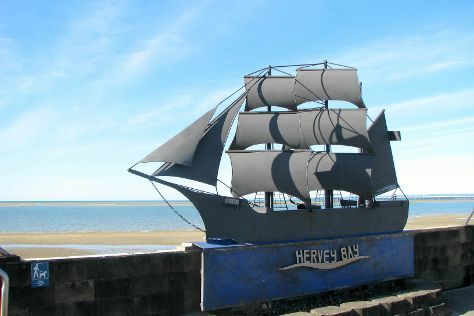 To see other places to visit, traveler tips, ratings, and more tourist information, refer to the Hervey Bay travel itinerary planner . Sydney to Hervey Bay is an approximately 3.5-hour flight. You can also drive; or take a train. Expect somewhat warmer weather when traveling from Sydney in April: highs in Hervey Bay hover around 32°C, while lows dip to 20°C. Finish your sightseeing early on the 22nd (Mon) to allow enough time to travel to Agnes Water. Kick off your visit on the 23rd (Tue): explore the wealth of natural beauty at Lady Musgrave Island and then take in the pleasant sights at Paperbark Forest Walk. For reviews, more things to do, traveler tips, and more tourist information, you can read our Agnes Water day trip planning site . Traveling by car from Hervey Bay to Agnes Water takes 3 hours. In April in Agnes Water, expect temperatures between 32°C during the day and 22°C at night. Finish your sightseeing early on the 23rd (Tue) so you can travel back home.